This information should be used as a guide only – the real test is on the Course! trouble on the steep bank behind the green. open wide green with a flat hole. fairway. The eighth is a straight par three. hole that has a number of undulations that make pitching and chipping difficult. sharp right turn in it and the seventeenth a tiered green. right all of the way to the hole. This information should be used as a guide only - the real test is on the Course! First Hole: The course commences with a gentle par four. Although by no means long, an accurate drive helps set up this hole. Water long and right shouldn't come into play. Trees on the right as well as a bunker on the front-right of the green make the left side of the fairway ideal for attacking. shaping the ball left to right. steep bank behind the green. towards Out of Bounds, especially when the course is dry. Fifth Hole: is a short par four up the hill. Avoid the fairway bunker and trees on the right. should have you thinking birdie. fairway is ideal. Out of Bounds runs along the far right of this hole. Eigth Hole: is a straight forward par three. There is a bunker on the front left of a green that slopes decidedly from back to front. Nineth Hole: is a longish par four. The fairway is wide and slopes gently to the left. There is a bunker on the left of the relatively flat green. a tricky up and down. 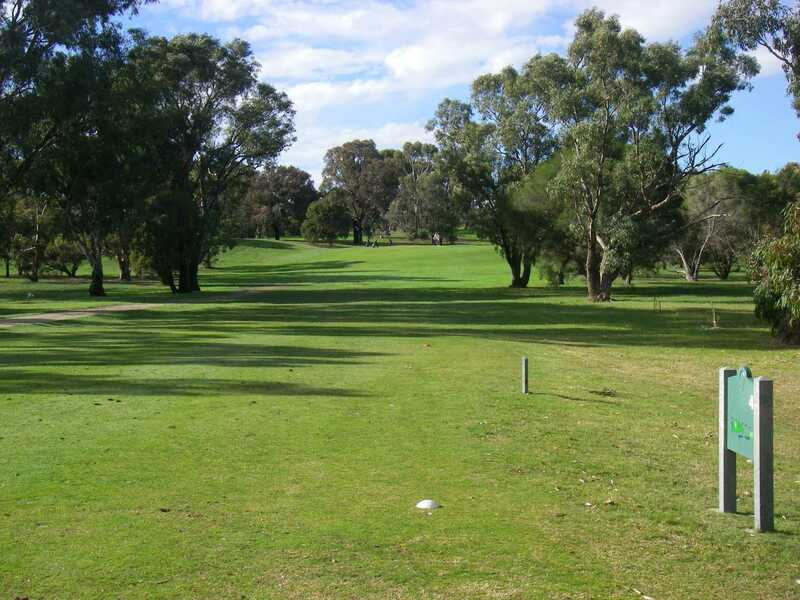 Eleventh Hole: a 380m par four bends right at a magnificent old river redgum. however a generous fairway and little trouble around the green. Thirteenth Hole: a 500m hole par five which bends to the right toward the end. Fourteenth Hole: a deceptively tricky hole has a slightly raised green with a number of undulations that make pitching and chipping difficult, without mentioning putting. 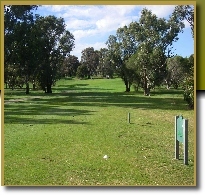 fifteen Hole: is the last 400m plus hole and is rated the hardest on the course. Seventeenth Hole: The 167m par three has a two-tiered green. Eighteenth Hole: Finally you will reach the last, a par five which fairway sweeps right all of the along the hole. The green slopes toward a bunker guarding the front right of the green. Reference: Hacker Summer 99/2000, p. 58- 60.